Think hackers are just aiming for the big guys? Think again. Recent statistics indicate that 43 percent of all cyberattacks target small businesses. Moreover, 60 percent of them will go out of business within six months of the attack. 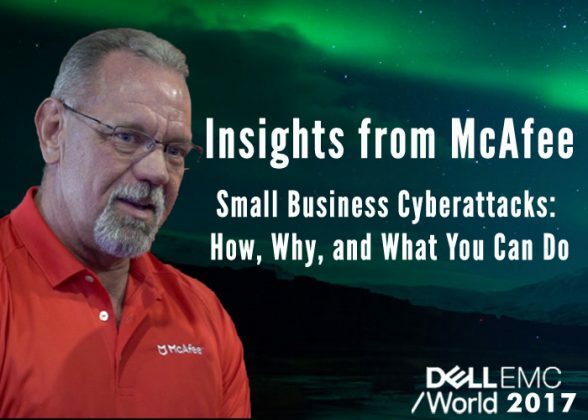 To understand why this is, I have a bonus interview to add to my Dell EMC World video series; a discussion with Gregg Earnhart, a Solutions Architect at McAfee. As Greg explains, small- and medium-sized businesses represent low hanging fruit to a hacker. With weaker security systems and small IT teams, they are easier to infiltrate. Even better, they are usually connected somehow to a larger organization. The hacker seeks to grab the low hanging fruit then slither up the tree to infect larger, connected businesses. Unusually slow performance of regular activities such as opening files or accessing websites. Inability to access a particular website or all websites. A dramatic increase in the amount of spam coming to your account. As Gregg tells us in the video, the point of these attacks is to disorient the end user so the hacker can pursue brute force attacks to steal your passwords. So as you are confused about why your computer isn’t working properly and doing things like rebooting or having the IT person investigate, the hacker is trying to guess your passwords in order to gain access to your accounts and infiltrate your data. How a #smallbiz can protect itself from #cyberattacks. An interview with Gregg Earnhart of @McAfee. Antivirus, which also includes spyware, malware, and ransomware. Sandboxing technology that places suspicious files in a ‘sandbox’ so they can’t affect the enterprise. Antivirus for the optimization of cloud environments. SIM technology (security incident management) which can quarantine a machine if a threat is detected in order to allow time to figure out how to handle the threat. Click Play on the video above to hear the full interview with Gregg Earnhart of McAfee, and don’t forget to check out all of the interviews in our Dell EMC World video series: an introduction with Erik Day, interviews with Elizabeth Gore, Bert Park, Erik Day, Brett Hanson, and Caroline Rodz, and a Q&A with Michael Dell.